It prevents moisture buildup, so rain and perspiration won’t leave streaks and sheens that can compromise your vision. Droplets ball up and bead off the surface. It repels oils, making it easier to keep lenses clean. Skin oils, fingerprints and lotions are easily wiped away without leaving residue, so you won’t get that blurring film common to ordinary lenses. It prevents dirt, dust and other particles from clinging to the lens. A lens can carry a static electrical charge that acts like a magnet for airborne particles. 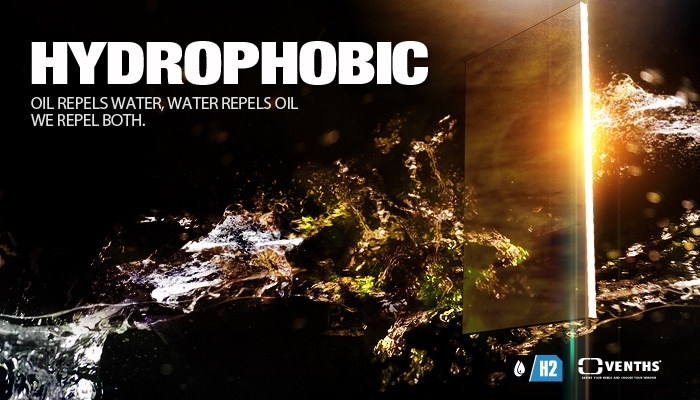 Venths Hydrophobic is engineered to eliminate the charge, so particles aren’t attracted to the lens surface. With these three performance features, Venths Hydrophobic technology creates an invisible barrier that easily sheds sweat, rain, sunscreen, skin oils, dirt and dust. The lenses are heavenly to clean and they stay clean longer than ordinary lenses, maintaining the highest level of clarity. The smudge-resistant barrier also repels skin oils and other contaminates. Even the “permanent” ink from a marker comes right off our Hydrophobic coating.